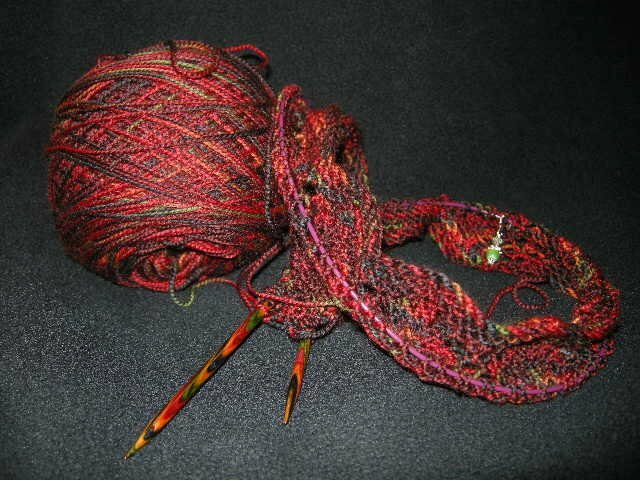 Abstract Fiber Supersock, in "Bonfire". Yeah, Baby! Yesterday I met Susan Stambaugh at her studio to show her the Desert Rain, and to continue sorting our cunning plan for Sock Summit. What a field trip! Her studio is a wonderland of color, in all different stages of preparation. I could have spent the entire day peppering her with questions about the dye process. She's also a wicked-cool spinner, which could easily have taken up another day. But back to the above: we decided to make a second Desert Rain in this color, just because. I am so besotted with this yarn that I can't even tell you. I, who never knit the same thing twice (in fact, I'm usually in hate with my projects when I first finish them - there has to be a cooling period before I love them again) cannot WAIT to make this camisole a second time. There is something addictive about it - the lace is so easy and accumulates so quickly - it's really hard to put down. You are going to love this thing. And here's the really big news: You will be able to buy Desert Rain in KIT FORM! That's right: the yarn, pattern, beads and ribbon, all conveniently pulled together for you in a ready-to-rumble package! I just love a good kit - All the decisions have been made for you; just add needles. So this week is all about patterns for me: I'm in the final stages of formatting the new Sommelier (which you will be seeing soon), I threw together Desert Rain for tech editing, I'm in full-throttle sample-making on Juliette (which you will see in Cast-On this winter), I'm ramping up for the Frog Prince Cardigan (which I want you to have in September), and I'm toying with a big fat idea for a pattern that will be good for handspun, with instructions for different gauges and sizes. My head is as full as a sack full of cats. And similarly well-organized. This weekend is the trip to Oregon wine country for the Sommelier photo shoot. There will be real models and makeup and everything. I have declared that we will have fun, and we all get paid in wine. When you are the boss and also all of the employees, you can make sweeping proclamations like that.